Captain Norman is no longer taking orders for Humidors. Norman Pugh is a Coast Guard licensed boat captain, but when he's not piloting someone's yacht he's usually engaged in his hobby and second vocation, wood working. Being a ships carpenter takes a lot of skill and patience and Norman draws upon these talents in his humidor projects. The result of all this time and effort is quite simply exquisite! 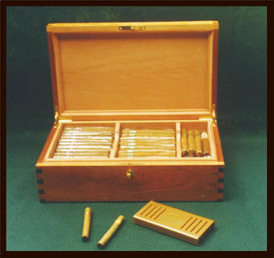 The Humidor pictured measures 10"x17"x5.5" and is constructed of 9/16" Cherry and Mahogany. 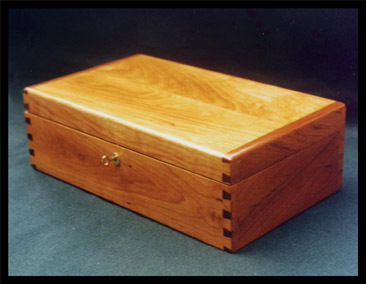 The removable liner and dividers are made of Spanish Cedar. Dove tail joints, gold plated hardware, and a soft smooth finish make this a box that you will treasure almost as much as those fine cigars that will fill it. See some more of Norman's fine work on his Portfolio Page. Oh yes, if you would like a good captain to pilot your yacht or deliver it to your favorite port of call contact Norman. You can usually find Norman at his work shop on Bayou LaCombe in southern Louisiana. He has delivered yachts down the Mississippi, through the Tennessee-Tombigbee water-way, across the Gulf of Mexico, down the east coast and to the Bahamas. Norman is a great Captain, I know because I have been on trips with him and besides... he's my father-in-law.